» Archived Review: HOWARD BROWNE as JOHN EVANS – Halo for Satan. Archived Review: HOWARD BROWNE as JOHN EVANS – Halo for Satan. HOWARD BROWNE as JOHN EVANS – Halo for Satan. Quill, paperback, circa 1984. 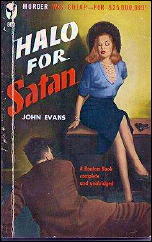 First published as by John Evans: Bobbs-Merrill, hardcover, 1948. Bantam #800, paperback, 1950; Bantam 1729, paperback, 1958. Over the years there have been mysteries written with the basic premise and understanding that the English language can be used to enhance the pure, unadulterated fun of reading. This is one of them. Paul Pine is a private eye, and even his client is an eye-opener and an eyebrow-raiser. And what Bishop McManus wants him to do is to track down a man who has offered to sell him a manuscript written, so he says, by Jesus Christ himself. The story goes on from there. I listened to the sound of high heels click into silence on the uncarpeted stairs. When there was nothing left but quiet, I lighted a cigarette and thought about Lola North. A slip of a girl who could put a flat-footed cop into his place, and who was probably proud of doing so. Maybe not, though. Maybe she was worrying a little over how easy the victory has been. And then again, maybe my sheriff’s star badge had been about as impressive as a grapefruit. A lovely girl, Lola North. Enough figure and not too many years and a face that could come back and haunt you and maybe stir your baser emotions. A girl who could turn out to be as pure as an Easter lily or steeped in sin and fail to surprise you either way. I got a shoulder under my eyelids and heaved hard and they slid about halfway before they stuck again. It was like opening cottage windows after a rain. Pain gnawed at the back of head like rats in a granary. The hunk of ribbon and the smooth red hair were back again, with a face under them I hadn’t noticed before. It was a face to bring hermits down out of the hills, to fill divorce courts, to make old men read upon hormones. A face that could sell perfume or black lace undies and make kitchen aprons a drug on the market. Good skin under expert make-up to make it look even better. Brown eyes, with a silken sheen to them. Eyes with a careful, still look as though never just sure what the brain behind them was up to. A nose you never quite saw because her full lips kept pulling you away from it. Hair smooth on top and a medium bob in back that was pushed up here and there to make it casually terrific. And my aching head was supported pleasantly on a cloth-covered length of firm warm flesh that was one of the lady’s thighs. Her expression said she thought I was out of my head. I would have liked to be, after what had been done to it. “Are you all right?” It was the kind of voice the rest of her deserved: husky, full-throated, yet subdued. Nine-thirty was early for me to be at the office, any morning. But I had wakened about eight o’clock, dull-eyed and unhappy, and filled with a vast restlessness that had no answer. It was a dreary, rain-swept day, raining the kind of rain that comes out of a sky the color and texture of a flophouse sheet and goes on and on. I opened the inner-office window behind its glass ventilator, put my hat and trench coat on the customer’s chair and poked my shoe at the windrows of office junk left on the floor by yesterday’s prowler. The cleaning lady must have taken one look at the wreckage and gone downstairs to quit. By eight-thirty I had all I could take. I had gone through everything in the paper except the want ads, there was a mound of cigarette butts in the ashtray, and my tongue tasted like something rejected by a scavenger. I glowered at my wrist watch, growled “Up the creek, brother!” for no reason at all and put on my trench coat and hat. 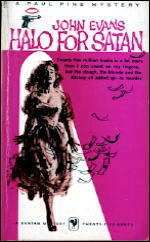 I dug out the McGivern mystery novel it finished it over half a pack of cigarettes. The women in it were beautiful and the private eye was brilliant. I would have like to be brilliant, too. I would even have liked to be reasonably intelligent. I put the book away. There is twist upon twist in the story that surrounds all these quotes, not all of them believable in the cold, clear eye of dawn, but they will make you sit up and take notice. Guaranteed. Note: The cover of the first Bantam paperback was “covered” earlier here on this blog. Someone said that Browne was the best of the Chandler imitators. I agree. I think the Paul Pine books are excellent. If someone wants to try a private eye novel without ever having read one I always recommend Browne over Chandler or any of the others. I even liked HALO IN BRASS with its shameful prejudiced ending and all! Besides — I have a built-in bias — the books are set in Chicago and Oak Park and do the city and its environs proud. There also was a short story in MANHUNT, February 1953. Many years ago, Howard Browne was a guest at Pulpcon and I spent some time talking to him about his novels and pulp career. He talked about his time as editor for the Ziff Davis pulps(What a great name for a pulp, MAMMOTH DETECTIVE!). He also explained why he stopped writing the novels. The money was in Hollywood and screen writing. Reminds me of the story about Joe Shaw, the editor of BLACK MASK and Hammett. Hammett stopped writing for the magazine in 1930 and was working in Hollywood. Shaw sent him a check for $500 in advance to get him to write another story. But Hammett returned the money; it was peanuts compared to what the movies were paying for scripts. Thanks for the list of Paul Pine books, Walker. It is a shame that there were only five, but I’d been Browne it’s highly unlikely I would have turned down the Hollywood money either. In any case it’s too late now. But you’ve reminded me that I’ve never read THE PAPER GUN, so I do have that to look forward to. If I recall correctly (and I do, since I just looked it up) the book also contains the MANHUNT short story you mention. You’re absolutely right about Browne being the best of the Chandler imitators. I’m sure I could have made this “review” three times as long, simply by quoting passages as good or better as these, and still not have said anything more about the plot than I did — which (as you may have noticed) was little more than nothing. Browne is Chandler with good plots. There I’ve said it. Browne is Chandler with good plots? You may be onto something there. On the other hand, for the sake of discussion, Chandler is read and remembered today by thousands of people, and Browne/Evans by maybe dozens at most. (I’m making the numbers up, but I’d be surprised if I were very far off.) How do we explain that? 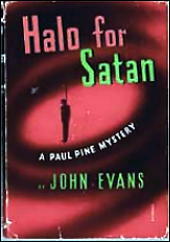 I didn’t even know my father (John Evans) wrote mysteries! 😉 Seriously, why did he use that pseudonym? Why did Browne decide to use John Evans as a pen name? That’s a good question. Browne’s book of short stories, INCREDIBLE INK (Dennis Mcmillan Tuscon 1997), also contains a lengthy memoir by Browne. I bought the book a few weeks ago, but so far I haven’t had a chance to sit down and read it. It might contain the answer. Anybody know? I also have the book “Incredible Ink” but have never read it. I do remember meeting Mr. Browne at a Pulpcon and had him sign a bound copy of Mammoth Detective (actually it was a copy he donated to the Pulpcon auction that I was lucky enough to win) in which he pointed out another of his pseudonyms “Bringle”, first name excapes me, but may be Howard? as well. I’ll have to check when I get home. Who knows how many names he wrote under. And why he had published “Taste of Ashes” under the Browne byline instead of “Evans”? Thanks, Michael! Some of these I knew, but most of them I didn’t. I suspect that most of the first bunch, except for Huggins and Spillane, were names he used writing fillers for science fiction pulps. I’ll add one more “William Brengle” to your list. I looked in my bound copy of Mammoth Detective I mentioned in #10 above and found “The Running Man” in the Jan.1946 issue. This bound volume also contains “Halo In Blood” May 1946 as well! He was a Pulpcon guest in 1991. Seems like yesterday! Thanks, Paul. I am sure there is more out there. That is the fun of research there is always something new to find.